Riding with motivation and enthusiasm are important prerequisites to creating a partnership that is equally pleasurable for the horse. Successful grand prix rider Uta GrÃ¤fâ€™s aim is fine riding on keen horses. Highlight: Uta GrÃ¤f talks about training her successful horses from horseback. Uta GrÃ¤f has made a name for herself on the international scene through her fine classical riding style which is particularly demonstrated during her harmonious performances. She has been a member of the B-Kader dressage team since 2011 and was on the long list for the London 2012 Olympics. 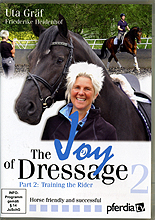 Her unusual combination of ambitious dressage riding and natural horse care in groups and open stabling has made her a trailblazer of the changing attitude to the horse and dressage.